There are a few places that are worth traveling half way around the world for. Pierre Herme is now definitely at the top of that list for me. Pierre Herme is famous for the wildly inventive flavors of its macarons. They also have an incredible selection of highly refined, absolutely perfect pastries. There are several locations in Paris. A small shop in mega-department store Galleries Lafayette only sells macarons and chocolates. The flagship store at 72 rue Bonaparte in Saint-Germain des Pres near the Saint Sulpice metro stop has everything – pastries, macarons, chocolates, and a line out the door. 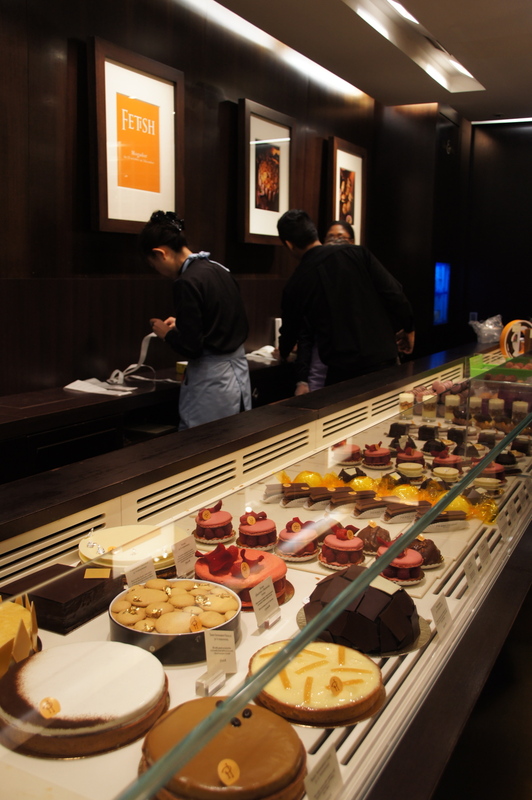 The store is elegant and the pastries are displayed like jewels. They are not cheap – a small pastry was 6,90 euros, and a box of seven macarons was 17 euros. But the thing I like about pastries is that they are still relatively affordable, once-in-a-while luxuries. Before going to Paris I did some web research and found the Paris Patisseries website, which has gorgeous photos and rankings of the best patisseries (specialized bakeries overseen by a master pastry chef) and pastries served in Paris. The one that initially caught my eye was the Tarte Infinement Vanille, made with vanilla from Tahiti, Madagascar, and Mexico. It has a perfect tart shell filled with a vanilla gel and topped with a vanilla mousse. Really rich and smooth. Then I chose the Ispahan, two rose macarons with raspberries and lychee filling. This was perfection, absolutely amazing, and the one I keep dreaming about going back to Paris for. The macarons are excellent with exotic flavor combinations. I really enjoyed the passionfruit and chocolate and the salted caramel. I only ate two per day out of the box of seven, but by the third day they had gone a bit stale. Lesson learned, next time I will eat them all at once!